Coral Food: Easy recipe & guide - how the pros do it every day. Coral Food: Easy recipe & guide – how the pros do it every day. Coral Food – What they need, what they like & how to make it! Coral Food: We know that corals eat in the wild and yet some forget that corals eating in captivity is the job of the caretakers. We must take responsibility for directly providing coral food daily. Target feeding or supplying a large amount of free swimming foods are your best options. Target feeding coral food requires patience, dedication and preparation of the food source. You can buy premixed frozen foods or you can make your own by following the recipe at the bottom of the post. Typically it is best when targeting feeding to turn of the pumps so that the animals have the best possible chance of catching their dinner as it goes by, but it is critical to remember to turn the pumps back on within an hour. Unless proper, well functioning skimmers and clean up crews are in place, any leftover food will quickly breakdown into waste and cause excess algae growth. Supplying a buffet of coral food will frustrate the perfectionist as this approach almost insures excess algae growth etc. It is an easier approach by simply adding phytoplankton, pods, rotifers etc to the system on a daily/weekly basis but the excess load can encourage excess algae growth. Once again – proper well performing skimmer and clean up crew do go a long way in nutrient export and will assist in keeping the algae growth to a minimum in most cases. There are issues with both options as with anything. Remember – we are attempting to house a closed eco system within our living room, replicating nature will increase our success substantially. 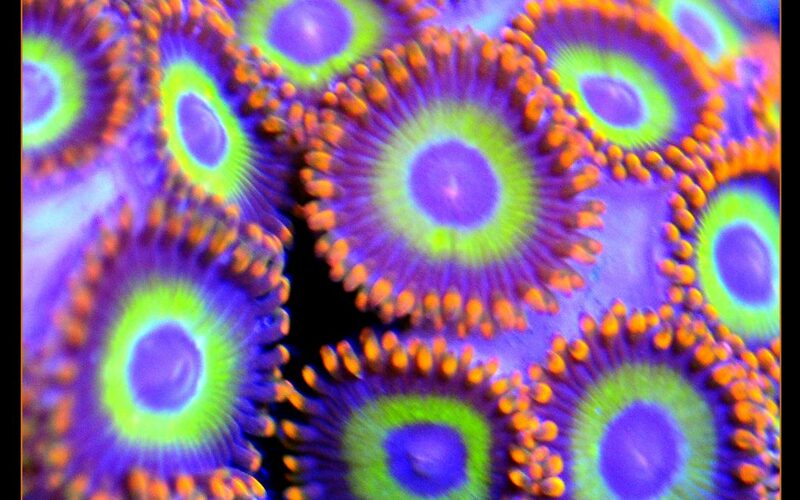 Typically I examine the oral area of the coral. If it looks big, chances are strong it will eat BIG food particles. You can start with smaller food and work up! Prepare your food based upon what they need. In kitchen blender, add thawed mysis shrimp, krill, blood shrimp, cyclopeze, vitamins, HUFA. This mixture can be stored by freezing in slabs or kept in refrigerator in a airtight container turkey baste it on to them with the pumps OFF. I usually leave the pumps off for about 1-1.5 hours. I like the ZoPlan and PhytoPlan by Two Little Fishies. Other people swear by DT’s Phytoplankton- Find a source for phytoplankton and your filter feeders will be forever grateful! Many large mouths corals love Copepods. Below is a photo I took several years ago of my dendrophyllia eating amphipods & copepods. It doubled in size in less than a month by enjoying these yummy treats! I have also fed Live Pods to Anemones, Blastomussa, Scolys, Chalices & Lord Acans just to name a few. I have included a handy guide for preparing coral food below. Enjoy!